With great pleasure, Atlassian presents Confluence 5.0. A cleaner look. A better experience. 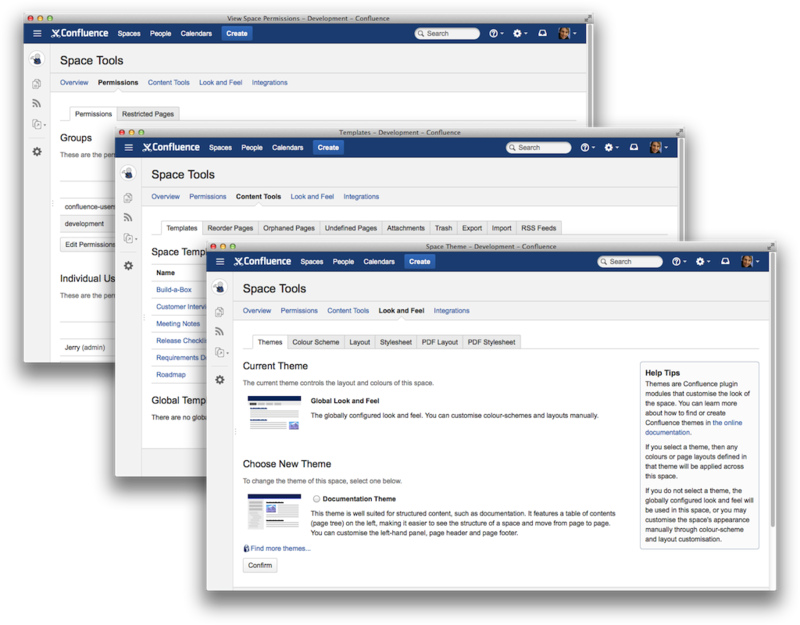 Confluence 5.0 introduces a modernized look and feel that is consistent with other Atlassian applications and follows the new Atlassian Design Guidelines. 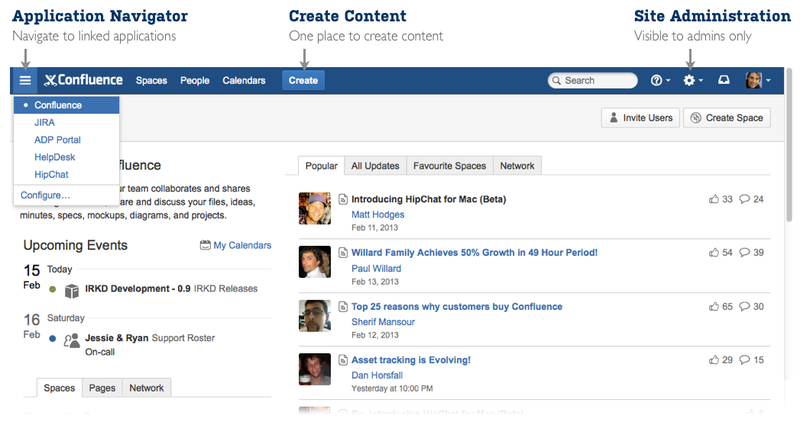 We have made a number of changes to the Confluence header, to improve usability and visual design. If you're using other Atlassian products, such as JIRA or Stash, you will also notice more cross-product consistency. New application navigator. This appears on the left of the header if your Confluence site is linked to other applications. 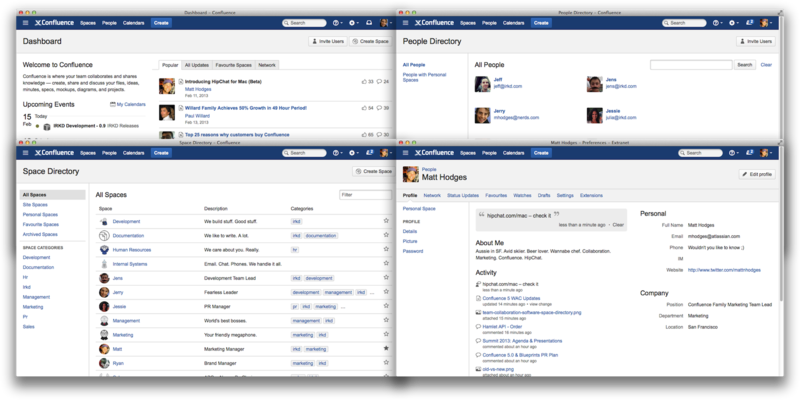 Using the application navigator, people can move easily from Confluence to JIRA and other linked Atlassian applications. Administrators can add more links too. For example, link to your internal HR systems, corporate applications, external web links, and so on. Space directory and people directory immediately accessible. The new header includes options pointing directly to the space and people directories. Add-ons will also be able to add items to the header. For example, Team Calendars will add a 'Calendars' option. Consolidated help menu. A new top-level help icon presents links to online help, keyboard shortcuts, and other useful pages. Consolidated administrator menu. Site administrators can access add-on management, user management and general administrative settings, directly from the cog icon in the header. Site-level items now appear on the left of the header: Dashboard, space directory and people directory. Space-related items are now in the sidebar (see Sidebar below). Note that the 'Browse' menu remains available in the Documentation theme, which does not include the new sidebar. Just choose 'Create' in the new header. You can create an empty page, a blog post, or a page based on a template. Confluence will even suggest the space where your new page will go, based on the spaces you have visited or created content in recently. Rest assured, we've looked after power users too. Press 'C' on your keyboard to open the 'Create' dialog quickly. You can also navigate around the dialog using your keyboard. Note: The 'Add' option no longer appears at top right of Confluence pages. It is replaced by the 'Create' option. To add a comment, scroll to the bottom of the page or press 'M' on your keyboard. What is in this space? What are the most important links that I should be aware of? The sidebar appears on the left of every page in spaces that use the default Confluence theme. From the sidebar you can choose a content type (pages, blog) or go to a different part of the space. Contextual navigation options appear at the bottom of the sidebar, based on the type of content you are viewing. For pages, the navigation section displays the children of the current page. For a blog, the navigation section shows a history of blog posts. Space administrators can access the redesigned 'Space tools' pages from the sidebar, as well as the option to configure the sidebar. Space administrators can configure what is displayed in the top section of the sidebar. Configure your space logo and name. 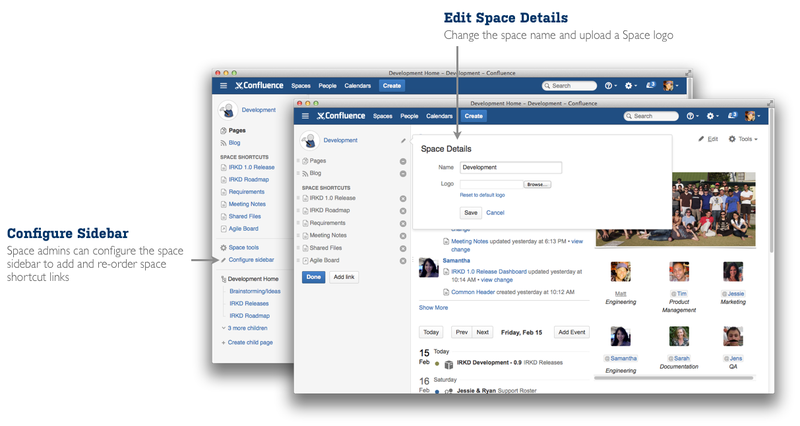 Customizing the space details for your team or project has never been easier. Show or hide pages and blog. Perhaps you don't need a blog in your space, or perhaps you are using only the blog? You can show or hide the links, so that people don't stray into a content desert. Add space shortcuts. 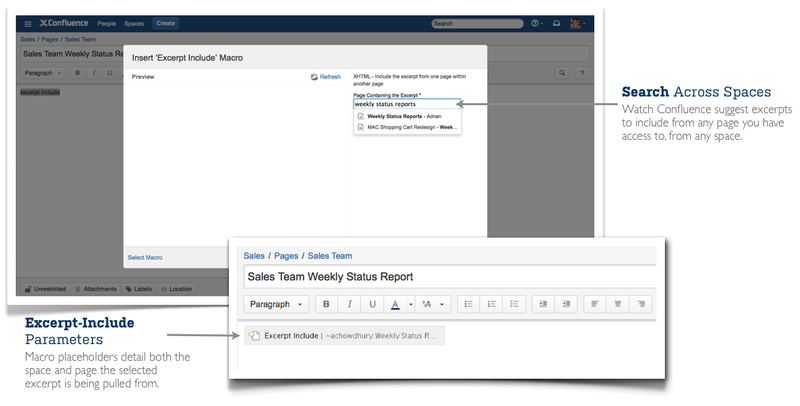 Help your team members and colleagues find important pages and other content, by adding shortcut links on the sidebar. This is a great way of encouraging collaboration and improving productivity. Collapse the sidebar to make best use of the space available. Click and drag the border, or use the keyboard shortcut: '[' . With the sidebar collapsed, you can still access the sidebar options. Increased speed means increased productivity. Confluence 5.0 instantly loads the editor when you choose 'Edit'. You don't have to wait for a full page refresh. Even faster: Type 'E' to start editing a page. With a new visual refresh, the responsive editor toolbar and footer maximize your editing space based on the size of your screen. This is useful for lower resolution devices such as projectors. When your browser window is reduced to a certain size, the buttons and spacing in the editor toolbar and footer will shrink – perfect when doing presentations or taking notes during a meeting. WYSWYIG YouTube video macro placeholders. 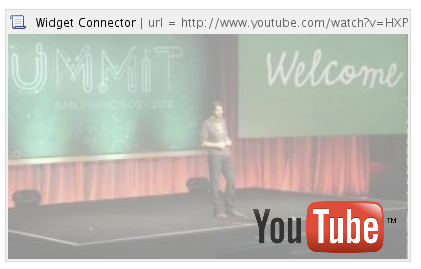 When you paste a link to a YouTube video, you will see a preview – right there in the editor. New Content Report Table macro. This new macro makes it easy to generate a report like the Content by Label macro, but in tabular format. See Content Report Table Macro. Including excerpts across spaces. The Excerpt Include macro can now include content from another space. When you type the name of the page into the Excerpt Include macro dialog, Confluence will offer a list of matching pages including those from other spaces. The wiki markup option is also available. You can type the space key followed by a colon and the page name, like this: MYSPACE:My page name. Nested Expand macros. You can now include one Expand macro inside another. Metadata Details and Details Summary macros renamed. The Metadata Details and Details Summary macros have been renamed to be more descriptive, and make it clearer that these two macros are used as a set. The functionality of the macros has not changed, and an upgrade task will automatically change the names over. The wiki markup and storage format names have not changed. Finding pages you have visited recently is now easier than ever. A new dialog displays a list of your recent pages that you can search through and navigate quickly. Open the dialog by clicking on the user menu then choose 'Recently Viewed', or use the keyboard shortcut 'g' then 'r'. Our design team has given some love to the space administration pages and other space tools, so they now have that special Confluence 5.0 magic too. When you visit the new 'Space tools' option, we automatically take you to the permissions screen, since this is the most-used space administration page. Note: In spaces using the default theme, the 'Browse' menu is gone. It is replaced by the options in the new sidebar. If you have an add-on that adds an option to the space administration screens, you should test your add-on against this release and adjust the location of the option if necessary. In the new Confluence header, you can customize the look and feel to fit your company branding by uploading your corporate logo. Details are in the documentation. 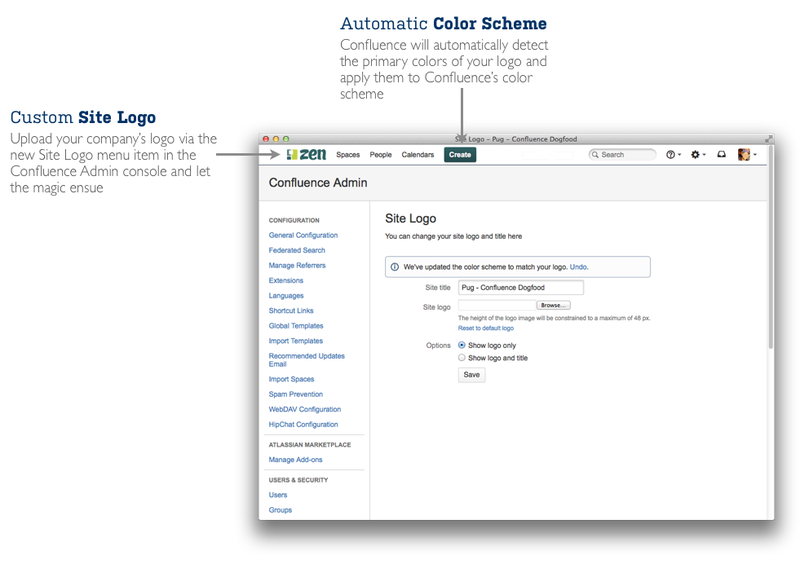 To make it easier to theme your Confluence site, upon uploading a new logo we automatically detect the primary colors use magic to configure the site color scheme to match. We have made a number of improvements to user and group management, which are especially useful on sites with a large number of users. We have removed unnecessary data retrievals when synchronizing LDAP directories, which gives a marked improvement in performance. See issues CWD-3034 and CONF-23943 . When browsing the list of groups, you can now search for group names containing a specific string, and adjust the number of groups displayed on a page. We have also improved the pagination when searching through groups. You can now choose whether to show 10, 20 or 50 results per page. Exclude deactivated users from the people directory by default, and provide the option to include them if required (CONF-16477 , fixed in Confluence 4.3.3). Similarly, exclude externally-deleted users from the people directory by default. Details are in the documentation: Searching the People Directory. Fix the bug that caused the people directory to appear empty or to show inconsistent results, after users have been deleted from LDAP or another external user management system (CONF-11467 , fixed in Confluence 4.3.3). Make sure users from LDAP appear in the people directory and search results even when not logged in ( CONF-6404 , fixed in Confluence 4.3.2). Need to share that company announcement as a PDF document? Just like pages, you can now export blog posts to PDF. Go to 'Tools' > 'Export to PDF'. Want to delete a specific version of a page? Now you can. Go to 'Tools' > 'Page History' and choose the option to remove a particular version of the page. This improvement satisfies more than 250 votes! Let's say you are viewing a page, and someone adds a comment to that page, or updates the page. Wouldn't it be cool to know about the comment or the update immediately? Now you can! Confluence displays a popup notification near the bottom of the screen. Choose 'Show' to see the comments, or 'Ignore' to dismiss the notification. 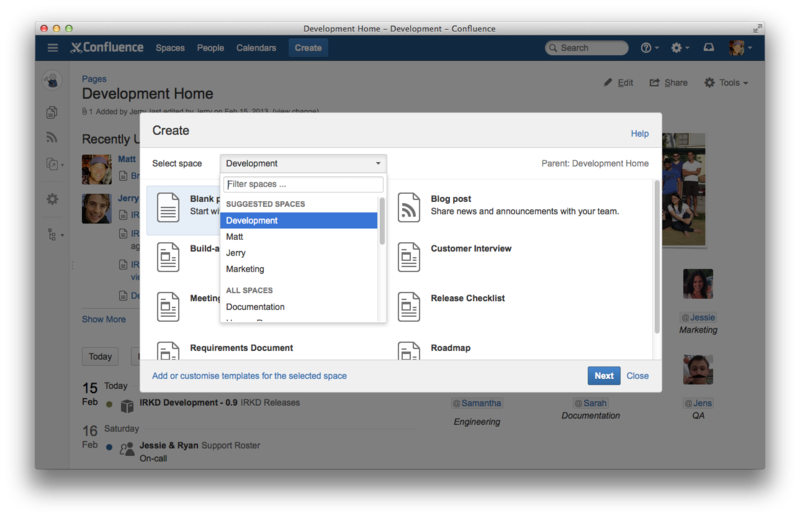 Want to customize the home page of all new spaces created in Confluence? Administrators can now edit a template for the home pages of site spaces and personal spaces. The process is quick and easy, and does not impact your existing spaces. You can now use a template to configure the top left section of the dashboard (the 'site welcome message'). This gives you the full power of the rich text editor to create the welcome message. These are points of interest for plugin and add-on developers. Atlassian Design Guidelines. 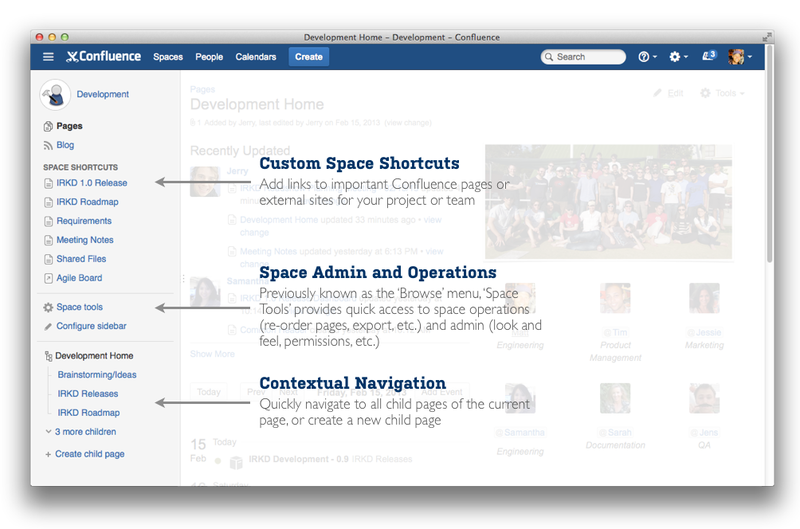 Confluence 5.0 introduces a modernized look and feel that is consistent with other Atlassian applications. 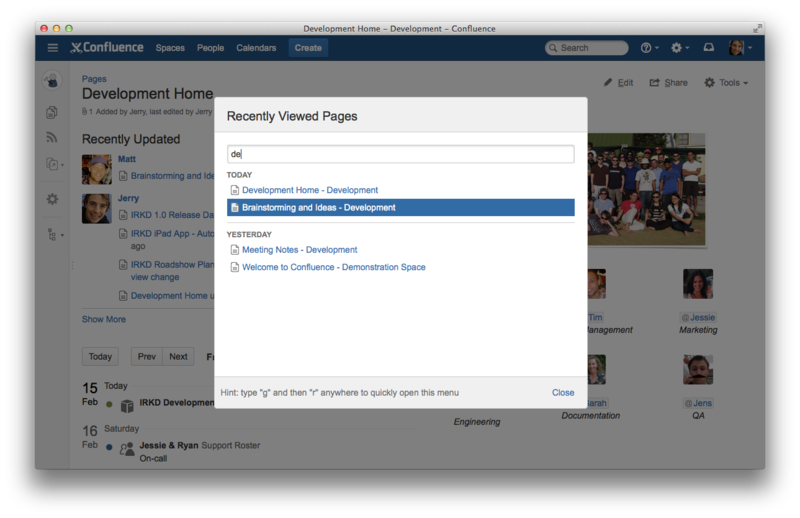 These changes include a major upgrade to AUI (the Atlassian User Interface). We have also upgraded the version of jQuery that Confluence supports. Your plugin will look different if it uses AUI. If it does not yet use AUI, your plugin will look out of place in Confluence 5.0. 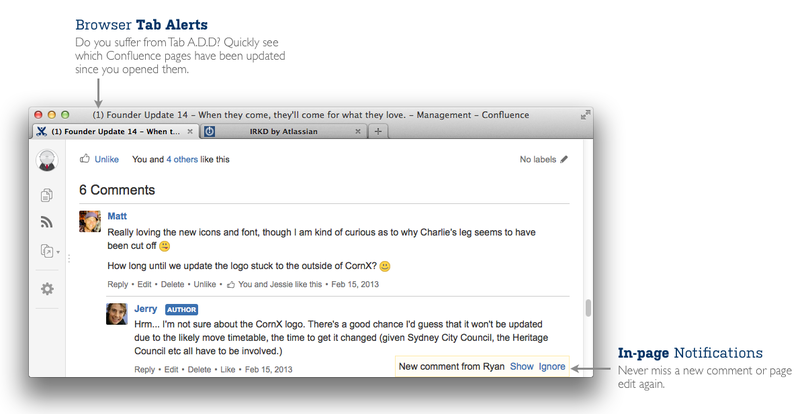 We recommend that you follow the new Atlassian Design Guidelines. See our guide to Maintaining web resources during ADG rollout . AUI upgrade. 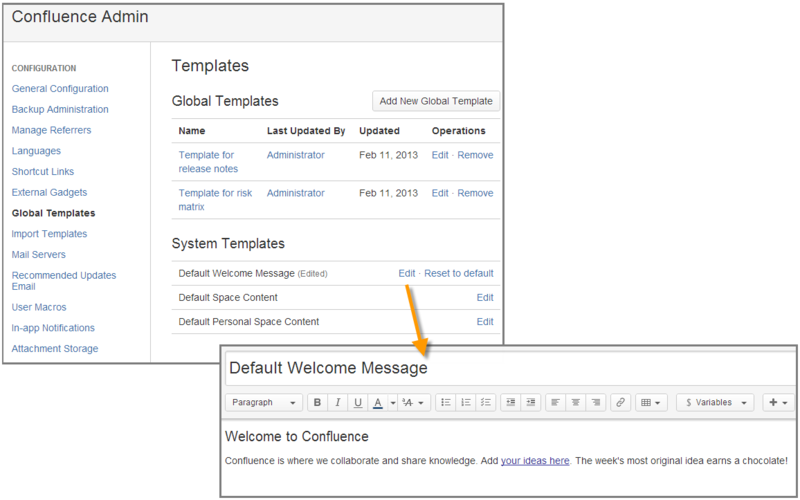 Confluence 5.0 includes the latest version of AUI 5.0. UPM upgrade. 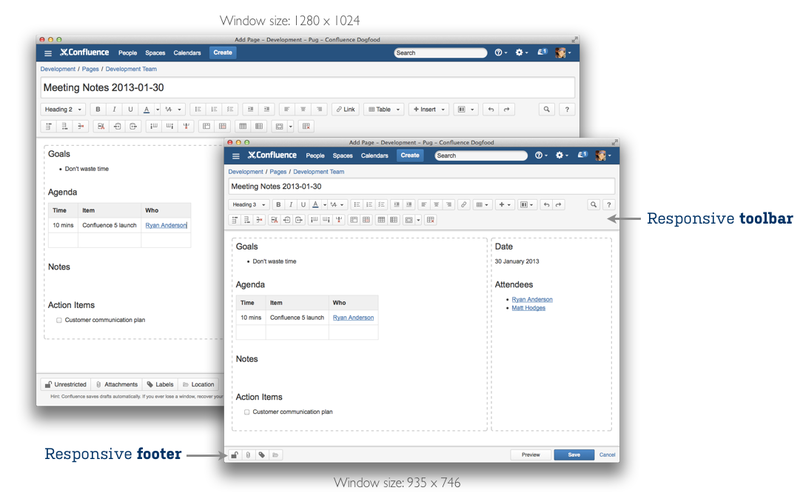 Confluence 5.0 ships with version 2.8.1 of the Universal Plugin Manager. Note that you can upgrade your version of UPM at any time, via the add-on manager in your Confluence administration console. AppLinks upgrade. 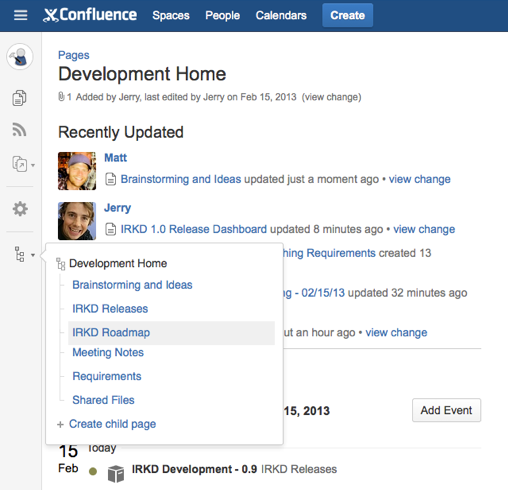 Confluence 5.0 includes version 3.10.6 of Application Links . Note that people with 'Confluence Administrator' permissions can now configure application links. Previously, you needed 'System Administrator' permissions to configure application links. New Web-UI module for Confluence 5 space sidebar: system.space.sidebar/main-links: See our updated guide to Web UI Modules. How to add an administration task in the new Confluence header, visible when the user clicks the cog icon, then Administration: See Creating admin console tasks for your add-on . How to ensure that your macro will be displayed on mobile devices: New mobile render mode for macros. Web item plugin modules which use the "system.space" section will now appear as tabs under Space Tools. More updates for developers. Please see our guide to preparing for Confluence 5.0.